Alain has a long-standing personal meditation practice- both movement and sitting – that informs his teaching, and all the work of “Moves into Consciousness “ of which he is the founder and co-director. He is an active Transpersonal and Psycho-Spiritual Psychotherapist, registered with the United Kingdom Council for Psychotherapy for over 20 years. Since then he has taught regularly all over Europe as well as teaching in Australia. Canada, Iceland, Israel, Mexico, South Africa and the USA. He has taught the 5Rhythms at Waves, Heartbeat and Mirrors levels and on the 5Rhythms Teacher Training. He has studied and worked in depth with the Darling Khan’s (founders of Movement Medicine),and with Andrea Juhan (founder of Open Floor) with whom he has also studied profoundly and co-taught. He studied Psychotherapy with Ian Gordon-Brown and Barbara Somers who, along with Gabrielle Roth are the three people that he considers as his root teachers. 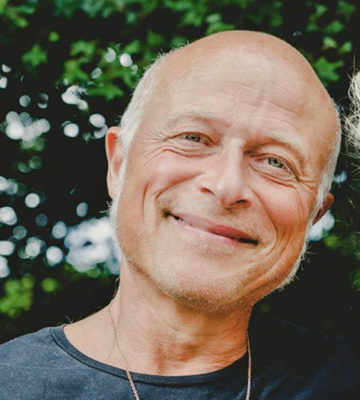 Alain along with his wife, fellow teacher and long term partner, Sarah Pitchford (co-director of MIC) is entering a new phase of teaching which incorporates the essence of their experience of Movement Meditation over the last 27 years expanded beyond any one solid form of study, technique or practice. This evolution of his work into the more subtle and esoteric territory of what he has learned from movement, therapeutic and spiritual maps throughout these years of practise is what he now seeks to share. He works with breath, sensation and awareness as it arises, using where appropriate, various movement methods, and none. Alain is the author of two published children’s books, one of which, a small story about change, movement and the nature of Being on the Earth in a Body, was successfully presented as a piece of performance theater last year promoting both movement and unity to active audiences. He is in his early sixties, and has 5 delightful adult children, and 1 beautiful grand-daughter. Copyright © Mandala Productions. LLC.